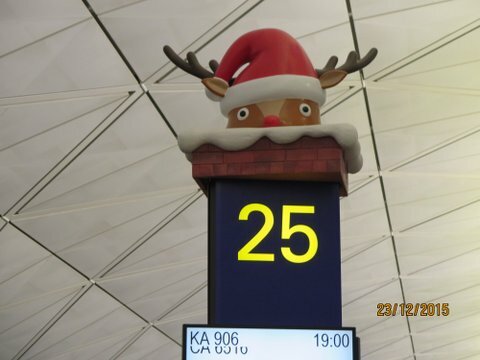 Decades ago, I spent a few magical days in Hong Kong, and since then have only flown over or through the airport. This time, en route to Indonesia, I thought my husband and I could break our trip with a bit of rest and a quick look at that iconic city. I imagined crowded, crooked streets, noise, hawkers, blinking lights, noodle shops, lanes of fabulous cloth bordered by the signs of fabled tailors. In my mind’s eye, fancy hotels and glittering high rises were somewhere on the periphery, and the beckoning harbor busy with ships always in view. As it turned out, fatigue overcame adventure and we slept more than intended. In fact, we never left Hong Kong Airport, a city in itself. Instead of the bustling, pungent metropolis, we encountered only a clean, air-conditioned version of Santaland that could put most American malls to shame. 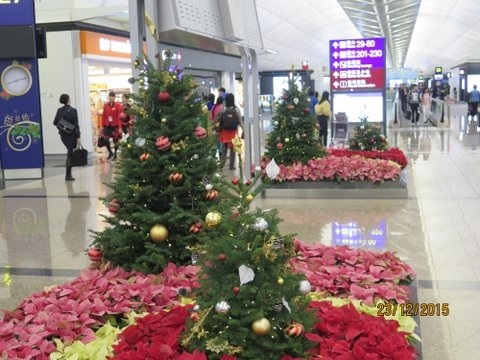 It started with the multi-storied Christmas tree in our airport hotel. 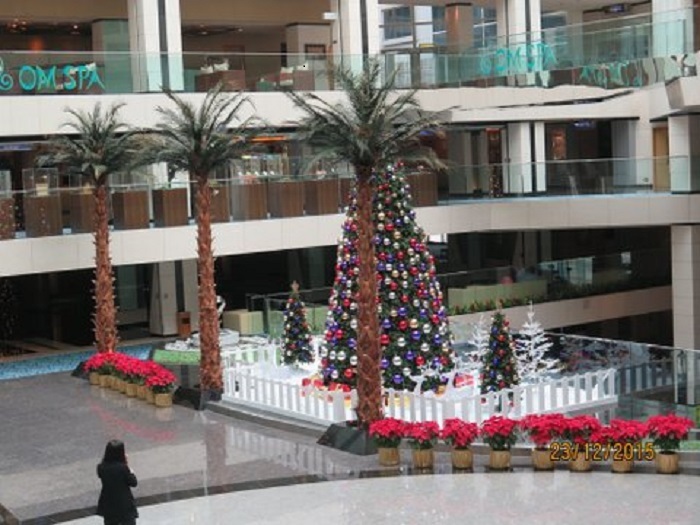 The closest comparison that came to mind was Neiman-Marcus in downtown San Francisco with a gigantic frosted tree filling its Victorian atrium. Well, a tree is one thing, but what to make of surrounding scenes of snow-covered houses, twinkling lights, colored balls—and Santas everywhere. And, of course, sales. What to think of the endless American Christmas music, 50s-style, with long-dead crooners throbbing from every loud-speaker: “I’m Dreaming of a White Christmas,” “Frosty the Snowman,” “Have Yourself a Merry Little Christmas,” and of course “Rudolph”? Trying to make sense of this, I rummaged through what I know of Hong Kong—it’s famed Buddha, its British past, its (presumably) Communist present, to account for the Christmas boom. While pondering and waiting for our flight, two elf-like young people in seasonally red suits with Santa hats followed the moving walkway singing Christmas carols. I was with them through “Silent Night” and “O Come All Ye Faithful.” But when they burst into “Feliz Navidad,” my Buddhist-British-Communist construct fell apart. Landing in Jakarta, where we’ve been many times in recent years, I figured I’d be on surer ground. I figured wrong. We’d actually never been here at Christmas. 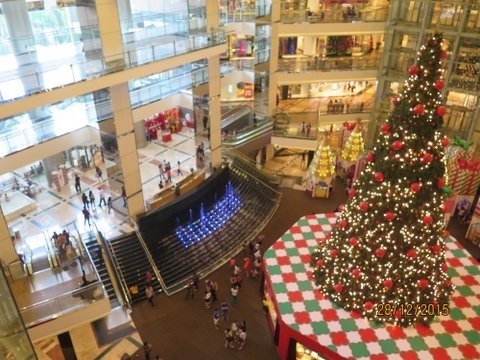 Encountering streams of blinking lights, ubiquitous Santas, greetings, holiday sales, vast decorated trees, and oh, yes, did I mention American Christmas songs? in this capital of the most populous Moslem country in the world did come as something of a surprise. 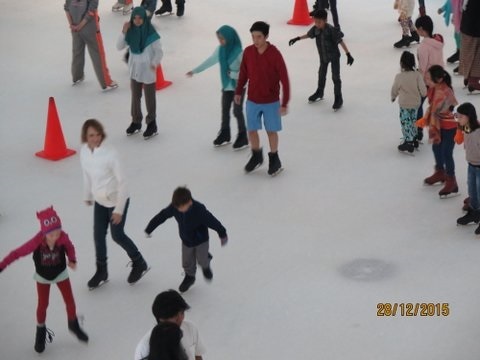 I had never imagined people greeting us with “Merry Christmas” here; nor taking our grandchildren ice skating on a rink crowded with bundled-up Indonesians, many of them gliding by in hijabs; nor watching them climb on fake polar bears. 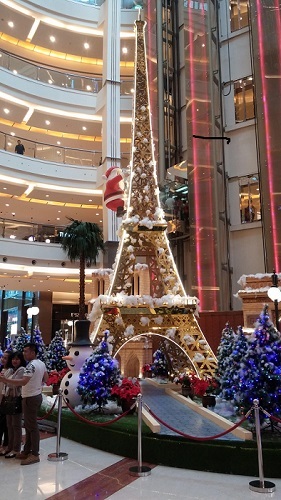 As for Santa climbing a frosty Eiffel Tower nestled between Cartier and Louis Vuitton…. Outside the palm trees bend in a thunder storm and the bougainvillea climbs up my window sill clamoring for the sun. I strain to hear the call to prayer, as I always have on previous visits. But this time I hear “Jingle Bells” and wonder at the transformation. I try to picture other great Asian cities I’ve visited—Shanghai, Saigon, Bangkok, Singapore—and imagine them as variations on the same. That is, I imagine them with dazzling displays of Christmas greetings, none of them having to do with Christianity. That big C writ everywhere? How about Commerce, Cash, or Capitalism—far from humility, charity and loving thy neighbor as thyself, but powerful global messages for our time.